Being on my own healing journey, as well as supporting others on their own, I’ve often wondered what is the reason healing doesn’t happen, per say, overnight. Why, despite all the work done to release an issue, that it either so much time and effort to be healed. Can reappear in other ways or not be 100% released. What is the reason it usually takes several sessions of healing related to the same issue before we are liberated from it. Seeking to understand the process of healing. The common analogy used to describe the healing process is the layers of an onion. As in with an onion when you keep peeling the layers back you get to the core. That too with healing as you peel back a layer, which in healing involves having acceptance of what is and what has been, letting go and integrating the lesson, you get to the core matter and healing is able to occur. So whilst I believe this to be somewhat true of healing I don’t believe it is the best analogy to explain the reason healing takes time and/or the healing process. Recently I saw this saying “Healing unfolds in its own time; it doesn’t look to a calendar or clock for direction” (unknown). After having worked on several aspects of an issue, I personally came to understand that in divine timing the healing just falls into place. Just like <snap of the fingers> that. Similar to how a mechanical puzzle works. In that all the parts are interlinked and once the parts are in the right place the puzzle becomes whole and/or unlocks. Each healing session can be considered as interlinked parts of the puzzle / greater picture. Knowing that each and every session has its own merit because it is critical to uncovering information required for the process of healing. And as with a combination lock once all the parts of the code are obtained, in the right and correct order, healing occurs to be the new way of being. The trauma, grief, pain, etc that occurs from people; situations; places; things fundamentally creates stress. That stress winds into the body and we hold it mentally; emotionally; spiritually; physically and/or chemically. Hence the reason it is important to have a modality (yes such as kinesiology) which helps unwind such stress from all aspects of who we are ~ mind; body and spirit. Once stress is unwound from the body we then need to process it in order to release it as well as integrate the benefit thereof. Sometimes that process can be very gentle however at times a person can have an adverse reaction to healing. Which means their processing can be emotionally overwhelming. The processing can be draining or they can have physical detoxing symptoms. If healing one aspect of an issue can have such an impact, imagine what healing the whole matter in one go would have on a person. The processing would be extreme and too overwhelming for a person to move through. Resulting in the healing having an opposing effect. Thus it is highly unlikely the person’s physical; mental; emotional systems could cope with such an overload of healing. Resulting in likely burn out and them simply giving up or retreating from the world. This being a main reason we don’t heal major issues in one session. The process of how stress winds into our body and with healing how it is unwound out is very similar to the Fibonacci sequence / Golden Ratio / Sacred Geometry. All of which are principles that describe the inner workings of nature and the Universe. These principles provide order to that which seems chaotic. Indicating there is an intelligent design and blueprint in all that exists. That there is no random way to which we grow. In nature we easily find these unfolding patterns and spirals; as in plants, shells, flowers and weather patterns. The same natural patterns are found in the human body, such as our brainwaves, DNA and structures. When you look at the cross cut of DNA it looks like a flower and the golden ratio pattern is easily seen. When we apply this principle to healing we understand there is a natural pattern and progression which needs to unfold in order for us to have growth and evolution. As with the Fibonacci sequence (Golden Ratio, Sacred Geometry) each session of healing combines with the previous one to provide the structure and foundation for the next stage. Meaning that the healing occurs in alignment with the universal order of nature, so too we follow the pattern for natural evolution to achieve universal and natural order within ourselves. By accepting there is a natural order to healing, a process of healing, we more easily allow for the uncovering and alignment of the code. Such code which as with the combination lock analogy when in the right place and order gives us the key for healing to be activated. We calibrate and align with the higher aspect of who we are to live with bliss, empowerment and ease! This entry was posted in Health and Wellbeing, Kinesiology, Spiritual and tagged Fibonacci sequence, Golden Ratio, Healing, Healing process, Sacred Geometry on 31/01/2019 by Lisa Westerlaken. One of my driving forces is to get results for my clients. It feeds my soul to know that, together, we are achieving the change they desire (plus more!). I pleased to say that most of my clients get results, so when I have a client who is hindering or sabotaging their results it leads me to question the reason for this…as well as the solution. Of which upper levelling is the key. are stuck in the “why” either trying to understand the reason <x> has happened or the reason why they are where they are at. The term “woundology” was coined by Caroline Myss to describe how people define and created an identity via their wounds, whether those wounds be physical, emotional, or social. Thus it is important for you to consider what your new identity would look, sound and feel like. How do you want to redefine yourself? For many people whether they are trying to loose weight, manifest something or heal when making any form of change they reach a limit where they are faced with a block to their change. Often this will show up as a plateau of some kind. This limit is the outer barrier of where your current comfort zone lies. Whilst many desire to heal and make change they don’t have the tenacity and willpower to push through their limit and barriers. Thus they will find ways to justify not continuing with the change work. It is at this point where you are faced with a choice to either sabotage your change so you fall back into our comfort zone OR to push through the limit to make change. To have lasting change we must work on all three aspects of our being. Humans are three dimensional beings, so it makes sense to use a modality which works on all three aspects, which is what Kinesiology does. Most modalities are usually only one dimension and in some cases two. This makes Kinesiology regarded as one of the truly holistic modalities. A Kinesiologist believes in a methodology called the “triad of health”. Which means that well being and health is dependent on the harmonious congruency and balance between a client’s Physical / Structural, Emotional / Mental and Nutritional / Chemical aspects. When one aspect of the triad of health is imbalanced, then it affects the other sides and therefore areas in our life. For example a person who chronically worries (mental) may lose their appetite (nutrition is affected) or experience irregularities in their body (physical). In many of my articles I refer to beliefs. This is because they are such a driving force of our emotions and behaviours. 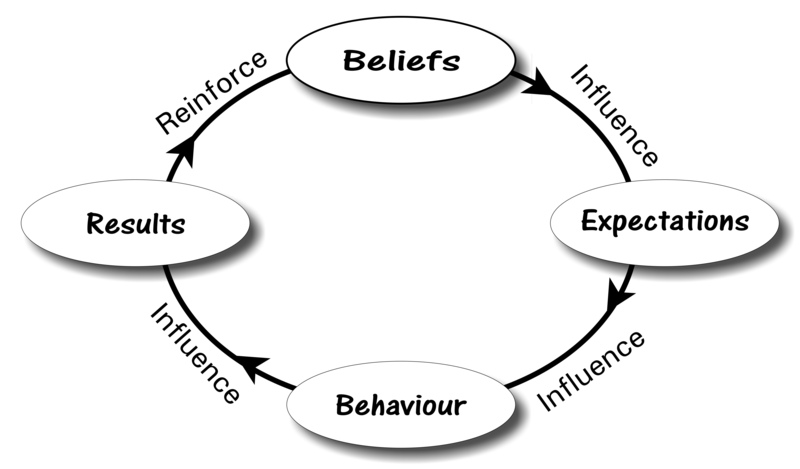 Simply put Beliefs are a self fulfilling prophecy. Some get stuck in needing the know the why….the why they are the way they are; the why something happened to them. Yet any sentence that begins with “why” is seeking justification not healing. If an unconscious person with a burst artery goes into emergency the doctors don’t stop to ask why did this happen, they simply move to apply the solution. They don’t need to know the “why” to apply the healing. Thus too, we can use the philosophy. The why isn’t as important as the how. Upper levelling is when we push through our limits which is done using techniques that work on mind, body and spirit. Yet as per Lao Tzu’s quote “A thousand mile journey begins with one step”. Be mindful that you might not achieve your desired change “overnight”, it also takes discipline and committed practice to achieve your healing goal. Which is the first step, defining what it is you want to achieve. Once you know what you want to achieve and have a defined goal. You then need to trust you can achieve this goal and take actions that align you to it. Ensuring the actions you take are from a mental, physical and spiritual aspect. Know that it is normal to feel vulnerable with any change. When you are upper levelling be mindful that the closer you reach the barrier of your comfort zone, the likelihood you’ll feel this. It is also important that when you reach here you keep moving forward, even if at a gentler pace. To move forward means you are taking consistent and authentic actions. Such actions that extend your limits to elevate your self to a new level – a new way of being and thus making change. One last thing….remember that any change, even if modest, is a move forward. This entry was posted in Health and Wellbeing, Kinesiology, Spiritual and tagged Woundology; Caroline Myss; Healing; Levelling; Kinesiology on 19/11/2017 by Lisa Westerlaken. Funk is a word which has many meanings, in fact did you know it derives from a Latin word “fumigare” meaning “to smoke”. For the purpose of this article it refers to that state of being where a person is feeling flat and demotivated, thus leading them to evade or avoid certain tasks. Its important to understand that funks are a perfectly normal part of life. It is the Yin/Yang ; the balance of life. Which means if / when you find yourself in a funk there will be a reason for it. Often when I find myself in a funk it is usually because I’ve been working too much and my funk reminds me I need to take time out. Many years ago when I’d find myself in a funk, I would fight it. I’d do everything I could to avoid and evade the feelings until one day I decided to stop fighting it. I started to be aware that my funk had many benefits to it. I noticed that when I was “funking” it was the only time I would ask for help and reach out to my friends. My funk also helped me to come up with brilliant ideas, strategies and insights. Also it was my catalyst to nurture and take care of myself. In that moment, where I stopped fighting my funk and allowed it just to be, it vanished. There is a wonderful saying “what you resist; persists”. So I noticed that as I embraced the lesson my funk was trying to teach me, it was no longer needed. Now when it comes to life lessons, I can be a slow learner, thus yes the lesson (and funk) has occasionally reappeared. However never to the depths that it had previously. This is because when my funk appears I now know the funk has a purpose and usually its to remind me that there is something I need to be doing which I haven’t been. So your funk has a reason too, it’s trying to get your attention so you can learn a lesson and/or gain insights. Maybe its to take time out or perhaps you taken enough time out. That it’s time to set goals and take action. It could be that your funk is reminding you to be grateful for what you have. Another possibility is that your funk is reminding you that you need to connect with the earth and ground yourself? or to be aware of what you are thinking, believing and focusing on. Just know that whatever the message is for you, will be right for you. The way to find purpose in your funk is to simply ask: What is the purpose of me feeling this way today? or What is it I most need today? or What is the lesson or information I need to move forward? Our divine self speaks to us directly and indirectly. So be aware that the answers may not come to you straight away. To trust that the information you need will be revealed, at the right time. Also indirect guidance and answers might come via words / insights of someone else. It could be words written in a book, or via a song. Your job is to ask the question, be open to the response and allow for it to be revealed. The more relaxed your are the easier it will come. Whilst you wait for your specific guidance regarding your funk, there are still things you can do to support yourself in shifting and moving forward. I believe the reason for this is because it gets you to change your focus. there are three elements, one of which focus is, that you can change in order to change how you are feeling. So make a list; what is good in your life right now? What is it that you are or can be grateful for? Who are you grateful for? What is it that you love doing that makes you happy? What made you smile today? Being outside has many different being. Most of it which it enables you to ground yourself. Grounding has both spiritual and physical benefits. Grounding is the process of connecting yourself to the earthly plane and bonding with mother earth. Native American’s believe that mother earth is the source of all life and is a great teacher to be observed, listened to and respected. Her energy is nurturing and restoring, assisting us to bring and give life to our hopes, dreams and ideas. Science tells us that the Earth is abundant with energy, particularly electrons, which have powerful supply of antioxidant effects. When you connect with the ground, preferably via bare feet, you are able to absorb large amounts of these electrons. Effectively you resonate at the same vibration as the Earth. So go to the beach, park or simply go stand outside on the grass with no shoes on. If you can’t do any of those may be go for a walk and soak in the elements, whether that be the wind, sun or rain. (If the latter just make sure you have a warm shower afterwards). The origin of the word, goal, has been thought to derive either from the Middle English “gale” meaning “a way or course” or the Old Norse word of “geil” meaning “passage”. Goals thus can be considered as a guiding tool which guide and keep us on course or provide the passage to where we want to be or what we want to have. As well as a way to measure and track how we are progressing. Imagine setting sail to sea without any co-ordinates as to where your destination will be. Whilst you will find a destination it may not be the destination you were after and you may waste a lot of time and energy in getting there. This is a great analogy of what life is like without goals. Whilst we are sailing through life and finding ourselves at certain “destinations” they aren’t always the ones we really want to be at or desire. In addition to this we’ve often wasted a lot of energy in the journey of getting to such destination, as the course taken may not have been as direct as it could have been. Energy which could have easily been used more effectively. Goals have an explainable magnetic quality that can attract situations, people and opportunities in order to support you achieving them. I personally believe that goals are a way to tell the Universe / God / Angels (whomever or whatever you believe in) what it is you want. Sometimes we need to simply stop and take time out. So why not sit in your favourite place and utilise that time in a productive way. Stories about others can help us get re-inspired. Most movies and books based on true stories have a message of “against all odds” achievement. That have insights of vulnerability, courage and motivation. That no matter what life has or is throwing you that things CAN change and that you can too. Some of our favourites are: In the pursuit of Happyness, The Blind Side, Moneyball, Loosing my Virginity, Daring Greatly and Big Magic. Whether it is going to the gym or getting out for a walk it doesn’t the matter. Exercise is about getting your body moving in a way that suits you. When you exercise it helps pump blood to the brain and it also releases the “feel good” endorphins and serotonin. It also helps to increase the size of the hippocampus, the functions of which are to regulate emotions and to access long term memories. In addition, exercise also helps create / increase the connections of the brain’s neurons which also helps with focus, ideas and solutions. Scientific evidence indicates that when a person writes they access both aspects of their brain. The physical act of writing accesses our analytical and rational left brain as well as engages our creative, intuitive, feeling right brain. By engaging both hemispheres we increase our innovation, which means we are able to transform and morph from situations yet too we are able to apply different methodology and solutions. Spend 5-10 minutes listing all the achievements you have had during your day. Remembering that many things constitute as successes and it is idea for you to record all of them, no matter how big or small. What constitutes as an action worthy of recording are those actions you don’t usually take for example if you only drink three glasses of water and drink four that constitutes as a success. If you manage to start writing a report that you have been putting off, that constitutes as a success. I’ve used this tool personally and with many clients. It works brilliantly as a re-focusing and motivational tool. Many people find nurturing themselves quite difficult, with a lot of people not even sure how to nurture themselves. Self care can come in many forms and it is doing in in a way that is best for you. It might be going and getting your hairs or nails done, it might be simply doing that yourself. It could be taking your make up off at night, eating the right foods, or drinking water. It could be having a massage or seeing your kinesiologist. It could be going for a walk or sitting at the beach and having an ice cream. Self care doesn’t necessarily mean spending lots of money yet it could. It is whatever is going to help you feel loved, supported and cared for. My favourite is buying myself flowers. A definition of insanity is doing the same thing over and over and expecting a different result. For something to change; something needs to change. Changing your environment relates to many aspects of yourself and life. the environment of your mind, what you focus on and what you talk about. the people in your life or the place in which you work. Remember that funks are a normal part of life, everyone experiences them to some level. The key is to making sure your funk doesn’t go too low and doesn’t last too long. Sometimes one of the suggestions may work and at other times you might need to use a combination. Just know that when you are doing something you are taking action and that action will help support you in taking the action you want to be taking. This entry was posted in Health and Wellbeing, Kinesiology, Spiritual and tagged Action, Funk, Kinesiology, Mind Body Spirit on 09/09/2017 by Lisa Westerlaken. As was “goals” in the 1980’s, vibration, manifestation, abundance have all become buzz concepts right now. As with many concepts that become the “buzz” they tend to become so overused that people soon grow tired of hearing about it. So why is it important not to get tired about information relating to your vibration? Science is proving what Eastern philosophies have know for thousands of years; that your body is constructed from energy. This refers not only to the interactions that occur at a cellular level, yet also to the energy lines that run through your body, called Meridians, which Science can now detect. What has also been detected is that you are much more than your physical body. Surrounding you are interconnected fields of energy known as subtle bodies or auric fields. These fields interact with your physical body via energy connection points called chakras which then feed into the meridians. Just as you would practice for anything you want to master or become adept at, you also need to follow certain practices to ensure your energy vibration is at it’s best. Your external world is also a reflection of your internal world so the more you invest in being your best; the more the best of the world will invest in you. Common reasons most people don’t meditate are “I don’t know how to” or “I can’t sit for that long” or “I can’t switch off my mind”. Meditation is like running a marathon, as in it isn’t something most people can do straight away. As with training for a marathon you build up your stamina and endurance, so too meditation. You need to develop your ability to let go of your thoughts and to sit for periods of time. The benefits of meditation are well documented and from this perspective it is extremely important to recharge all aspects of yourself (physically, mentally and spiritually). Meditation allows us to be relieved of the density our energy has on Earth. We are light beings and thus meditation enables us to lighten our energy, thereby lightening our load and connect to the light source that is internal and external to us. Whilst I have no concrete evidence that can support for a fact that there are unseen Universal forces that exist, I have experienced many different situations that gives me evidence to believe that they do. These Universal forces help support us to bring into reality our ecological desires. When we recognise that these Universal forces exist we are able to connect to them to enable manifestation. The Latin word “emovere” which means to move is also the basis of the word emotion. Interestingly it also originates from the French word “emouvoir” which means to excite. When we move, we are exciting our energy and vibration. Yet to movement also means we tap into emotions and feelings which support us. When we move outside we are also able to access and absorb the negative ions which exist organically in nature. These negative ions enable us to be balanced, grounded, energised and to have focus and clarity. The Yin and Yang refer to the negative and positive aspects which exist in everything. Without both we become imbalanced and/or polarised about a person or situation. So when you can practice the Yin / Yang, which is seeing both the positives and negatives in equal amounts, then you are able to let go of the attachment and be empowered and at peace. Studies are showing that the heart emits more frequencies than our brain. Also that the heart sends more instructions to the brain, than the brain does to the heart. So when we are heart centred we are able to elevate our communication, thinking, decisions and choices to a higher level of consciousness. Commonly, in various modalities, the heart relates to: self love, love for others, compassion, empathy, forgiveness, acceptance, gratitude, beauty, peace and transformation. When you focus on doing this for yourself or another you are being heart centred. Gratefulness is an important attribute of being heart centred however it is also important from a focus aspect. To be grateful is to acknowledge all that you are (or can be) thankful and appreciative for. What ever we focus on, we will get more of. Also when we are grateful we let the light in, which in-powers us. It heightens and improves our vibration so we can receive more and in this case more “light”. We know that everything is interconnected so when you invest in your vibration you are fundamentally investing in all aspects of your well being. You are being active in creating the way in which you exist in the world. This entry was posted in Health and Wellbeing, Spiritual and tagged Balance, Energy, Focus, Gratefulness, Meditation, Outside, Universe on 07/06/2017 by Lisa Westerlaken. A Kinesiologist is an energy medicine specialist. Who places emphasis is on health maintenance, client education and responsibility by identifying the causative influences triggering health (mental, physical, chemical) imbalances. Anything a Kinesiologist does, or suggests the client does, is to restore health, wellness and vitality, therefore enhancing the clients innate healing energies. Whilst kinesiology is based on ancient techniques, which have been practised for thousands of years, it is a relatively new modality which was established in the early 1970’s. Founded on Western philosophies such as Chiropractic, Counselling, Anatomy and Physiology it was coupled with Eastern philosophies such as Meridians, Acupressure, Triad of Health and Chakras. A fundamental principle of Kinesiology is that the body, mind and spirit has innate ability to heal itself which, at times, needs support to re-align and connect to this innate healing ability. Humans are three dimensional beings, so it makes sense to use a modality which works on all three aspects, which is what Kinesiology does. Most modalities are usually only one dimension and in some cases two. This makes Kinesiology regarded as one of the truly holistic modalities. So what are the signs which may indicate it’s an ideal time for you to see a kinesiologist? Any type of loss and/or change can trigger the grief process. Also loss doesn’t just mean death, it can be a completion of any sort. Changes or loss can be physically; mentally; spiritually and /or financially. It may relate to the change or loss of a person; thing and/or place. Whilst grieving is specific process for the individual kinesiology can support the person through this. Many people live with negative emotions, accepting this as their “norm”, which results in them feeling less than great about themselves. Such feelings may be anxiety, fear, anger, self-doubt, frustration, overwhelm, tiredness / lacking energy, feeling on-edge, sad or teary. Many of clients have transformed these emotions and transformed their lives. If you describe yourself as feeling “out of sorts”, not “like yourself”, out of harmony and/or imbalanced and don’t have a logical (or medical) reason for feeling this way. You may also be experiencing stress due to life/work or imbalance. Our body holds immense wisdom and will give you signs that something isn’t being addressed and thus needs to come back into equilibrium. Such symptoms may be teeth grinding, insomnia, shortness of breath (for no apparent reason), restlessness, headaches, nail biting, muscle tension or cramping, body aches, stomach upsets or related issues such as bloating, belching, diarrhoea or constipation. Signs you are or have experienced neurological stress are brain fogginess, memory issues, loss of balance, co-ordination issues, difficulty concentrating and/or learning, short attention span, disorientation, variances in your vision and/or hearing. A number of my client have tried one dimensional modalities which, although have worked to some degree, haven’t really helped them shift. However kinesiology is getting them their desired results. Whatever it is you are doing, professionally or privately, and it isn’t working then kinesiology might be the right modality to help support your shift. To find a kinesiologist you can search the Australian Kinesiology Association (AKA) website via: https://www.aka.asn.au. Check your practitioner is Health Fund registered to ensure their qualifications are current and at the highest industry standard. You can also book an appointment with me via this link The Inner Sage Availability. Mention this article to receive a 10% discount. This entry was posted in Health and Wellbeing, Kinesiology, Spiritual and tagged Anxiety, Balance, Eastern Suburbs, Emotions, Kinesiologist, Kinesiology, Neurology, Randwick, Stress, Sydney on 06/06/2017 by Lisa Westerlaken.